Some twin sisters have attacked their father, pouring hot water on the old man’s head over a grudge they hold. Ben Maphanga is a South African man whose wife died more than a year ago, however his children are still blaming him for her death. According to Daily Sun SA, Ben claims that last week they poured boiling water over his head. 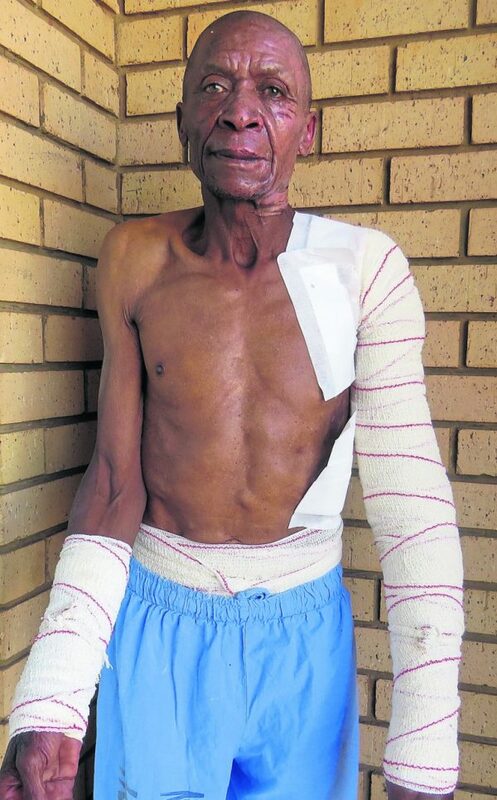 His wife, Pinkie Maphanga (64) died last year in August after a long illness but his twin daughters allegedly accused Ben (67) of killing her. Ben alleged they attempted to poison him last year but he survived. To save his life, he moved out of his house in Thokoza, Ekurhuleni to rent a room, but last week when he went back to the house he found his daughters still waiting for him. This time they poured boiling water mixed with fish oil over him. “They poured water on my head, saying they wanted my brain to be cooked so I would die,” he claimed. “Their mother was sick for five years. How could I kill my wife? I saw her dying of natural causes. “I can’t believe my biological children would do this to me. I’m in pain and I have been scarred for life.” Daily Sun phoned the daughters for comment but their phones rang unanswered. A relative said the daughters had left the house. Captain Andre de Jager of the Vosloorus cops said they are waiting for Ben to be treated. They will open a case when he is fit enough to make a statement.